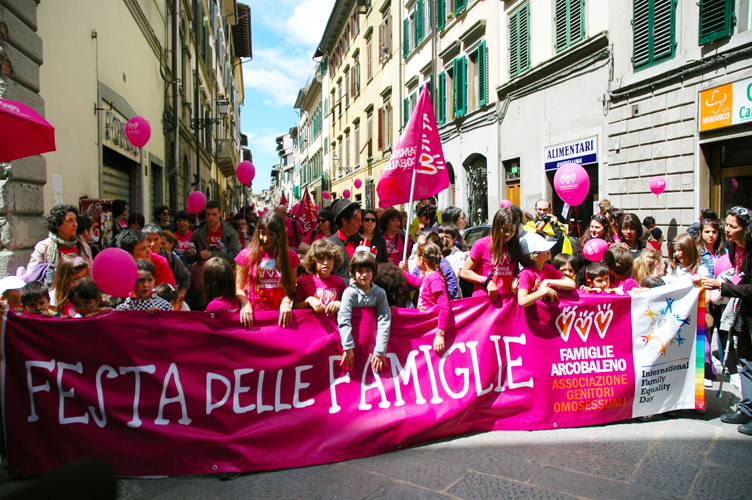 The 3rd of May 2015, Famiglie Arcobaleno, the Italian association of homosexual parents, will make IFED ( the International Family Equality Day) coincide with the 7th edition of its main annual event, the Festa delle Famiglie wich is the celebration of all kind of families. This year the Festa delle Famiglie will take place in Salerno, a city in the south of Italy, and will gather rainbow families from all-over the country as well as different groups, associations and citizens that believe in making a statement for equality and inclusion in society. The Festa delle Famiglie 2015 has the support of more than 100 associations and more than 30 local realities are actively cooperating on the programme of this incredible family celebration. It is important to point out that many of these associations are not related to the LGTB cause but they are participating and they are supporting this event because they perceive the fight for equal rights and civil liberties of gay and transgender people as their own. All the associations will offer their expertise for free organizing, together with Famiglie Arcobaleno, children laboratories, concerts, shows and many initiatives for children and adults throughout the day, from 10 am to 10 pm. Come to Salerno the 3th of May 2015 to tear down the walls of hate and prejudice!